Looking for a weekend getaway from Pune? Well, if you are a history lover and would love to take a stroll through aisles of ancient monuments as you savour natural surroundings, then the hill forts located in the close proximity of Pune should be on your bucket list. These hill forts not only provide its visitors with ancient legends but also soothe their nerves. If you are keen to explore one of these beautiful hill forts, then it is advisable to plan a tour of Rajgad Fort. As it is located in the vicinity of Pune, it makes for a great weekend getaway amid historical aisles and natural lanes. Read on to know in detail about Rajgad Fort and how to reach it. Rajgad Fort is a popular destination in Maharashtra and is visited by thousands of locals and tourists during the monsoon season. As the summers are very hot in the region, it is not wise to visit Rajgad Fort during the summer season. Apart from the monsoon, the best time when one can explore the grandeur and the surroundings of the fort comfortably is from October until the end of March. The fort is located in the Pune district of Maharashtra at an elevation of about 4600 ft, and hence over a period of time, it has become an idyllic stoppage for several trekkers, campers and history lovers. Even though the fort is believed to have been built several centuries ago in the early Medieval Period of India, it is mostly recognised for its relation with the Maratha Empire. As per records, this fort remained the capital of the Maratha Empire for more than 2 decades and it is the place where Chhatrapati Shivaji Maharaj stayed for the maximum number of days in the country. It is also the birthplace of Shivaji's son. In the early 19th century, the fort was captured by the British army. Therefore, it is of great historical and archaeological importance. However, on account of it being a hill fort blessed with lush green beauty, it is immensely popular amongst nature lovers. Today, the fort is visited by thousands of locals and offbeat travellers. If you are looking for a place where you can just chill and hang out with your friends, then there cannot be a better place near Pune than Rajgad Fort. It is a wonderful destination for every trekker, camper, photographer, history lover and architecture enthusiast. Here, you can also witness the ancient Padmavati Temple, which is a beautiful tourist attraction. 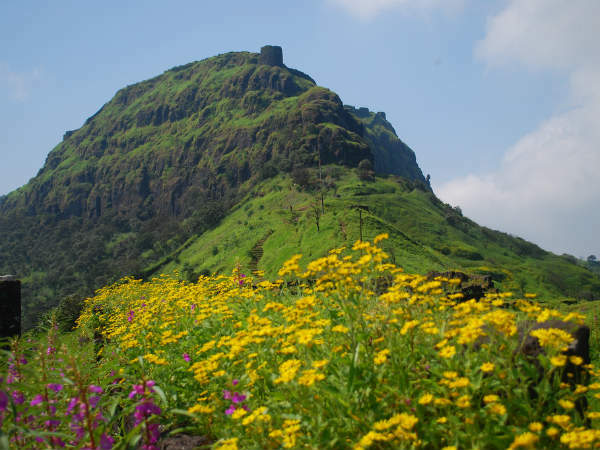 So, don't you think you must plan a tour of Rajgad Fort this season? By Air: The nearest airport to the fort is located in Pune at a distance of around 75 km. Once you have reached Pune, you can either hire a direct cab or use public transport to reach Pali, which is a small village at the base of the hills and it is the place from where one needs to trek up the hill. By Rail: You can catch a direct train to Pune railway station and then from there, you can either hire a direct cab or public transport to reach Pali. The distance between Pune railway station and Pali village is 68 km. By Road: The village of Pali is easily accessible by road. From the village, you need to trek up the hill to reach the fort.